Truespend is fully dedicated in helping companies manage their indirect and direct spend and in delivering strong bottom line benefits. by taking ownership and responsibility of analyzing requirements, creating sourcing plans and executing the sourcing projects following tested processes and tools with a clear dedication of delivering financial savings or other agreed results with minimal disruption to our clients operations. 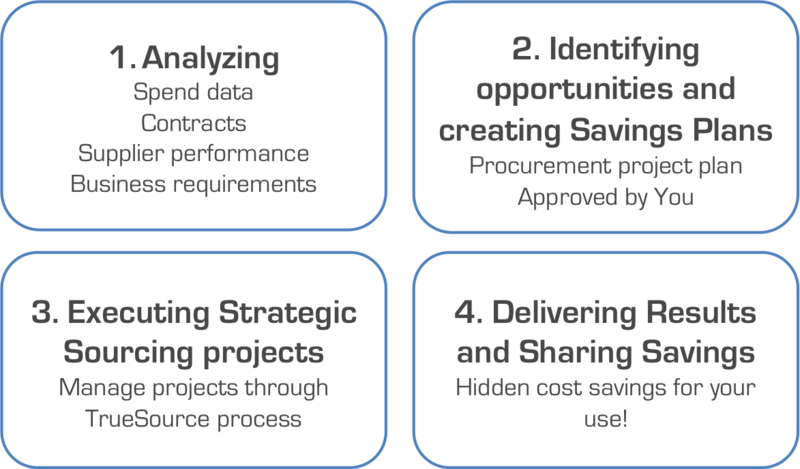 We operate as an extension to your existing procurement team or in case such does not exist, manage all or the selected categories independently but in close collaboration with your key stakeholders and with defined criteria – we ensure you remain in control by dictating the precise technical and commercial specifications before we start and monitoring each stage as we work through the solution. We work closely together with your business, but taking full responsibility in delivering what we promise. 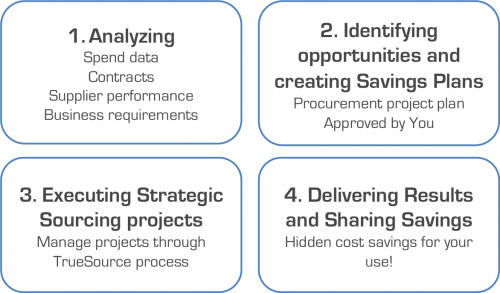 Our indirect procurement specialists analyze, plan and implement sourcing projects while keeping in mind more than sufficient communication towards your organization. Our main operating model is clear and simple. Our target is to provide our clients real value so our spend management fees on sourcing projects are mostly based on performance, so you pay against clear and defined results -> No Savings, No Fees, No Risk. And we back this up with a significant ROI promise. Significant sums of money is spent on IT, marketing, facilities, professional services etc. to keep companies operating. Unfortunately this money is not been used as effectively as it could be to maximize it's potential and in most cases, companies do not even know on high level how much is spent on which area or where that money is going to. Truespend has tools to change that all. Fast and effectively but still focused on understanding your business needs. - Truespend has the expertise, focus and dedication on indirect spend management and you can focus on business critical parts of business. - Truespend takes responsibility of delivery with minimal efforts needed from you.